You can explore the mountains, push your limits with full trust in your equipment - that’s the motto of the Tough & Dynamic family. 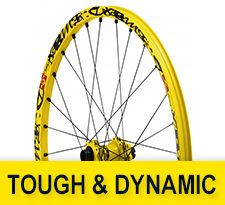 Mavic Tough & Dynamic products are definitely made to last. Testing is focused on strength and reliability. Whether racing or climbing on flowing single-tracks, the Fast & Light family will help you to be quick and save energy as well. 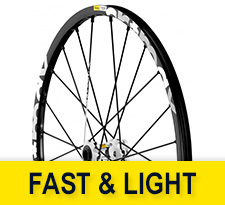 The Fast & Light family is all about lightweight, responsiveness and efficiency thanks to the most advanced Mavic technologies.